Celebration time for Cardiff City youth players. 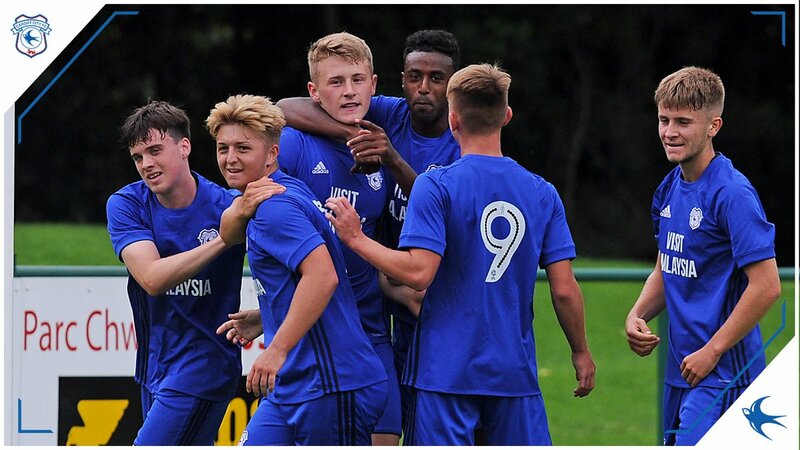 Cardiff City are intent on taking a step towards winning the Professional Development League Under-18 South title when they entertain Bristol City in a Severnside derby on Saturday. The young Bluebirds take on the Robins at Cardiff International Sports Campus, Leckwith (February 9, 11am). Cardiff are three points clear at the top of their division with a game in hand on second-placed Ipswich Town. The top two teams in the South and North divisions will qualify for the play-off semi-finals. City are also through to the Welsh Youth Cup quarter-finals and play Swansea City at home on Sunday, March 10. Action from the Welsh Youth Cup quarter-final involving Cardiff City (blue) and Llanelli. The young Bluebirds won 10-0. Pic: Cardiff City FC. Cardiff City, from: Jordan Duffey (gk), George Ratcliffe (gk), Connor Davies, Trystan Jones, Jake Davies, Ryan Kavanagh, Harry Pinchard, Knott, Jake Evans, Siyabonga Ligendza, Ntazana Mayembe, Taylor Jones, Thomas, Jack Clay, Maserani, William Warnock, Ben Margetson, Joel Bagan, Sam Parsons, Sam Bowen, Dan Griffiths, Sion Spence, Kieran Evans. Welsh Youth Cup semi-final draw (ties will be played on Sunday, March 10): Cardiff City v Swansea City, The New Saints v Cardiff Met or Llandudno.